Fencing: A fence is a great deterrent to criminal activity. The harder you make it for criminals, the safer you make your home. 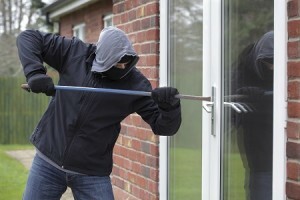 Windows and Doors: About 30% of all burglaries are through an open or unlocked window or door. For starters, make sure you lock your doors and windows. Period. Secondly, replacing old windows and doors with newer, safer models can help protect your home. Newer windows have improved locking mechanisms and catches that do not allow the window to open past a certain point. Home Security Lighting: Often overlooked by homeowners, security lighting is actually a very effective (and affordable) deterrent to criminal activity. “Good lighting deters crime and produces a more secure atmosphere,” according to a U.S. Department of Justice (DOJ) report. Because the majority of home burglaries occur at nighttime, additional lighting around your home’s perimeter can help deter burglars and vandals. Most home security lighting systems are dual-purpose, providing both added security and curb appeal. There is a huge assortment of lighting styles and systems available to blend with your existing décor. The additional lighting can also help reduce trip and fall accidents around exterior walkways and stairs. Perhaps best of all, a home security lighting system can reduce your homeowners insurance premiums. Insurance providers like to reward homeowners who take the initiative to better protect their homes. With more than 20 years of experience, TriStar Electric’s team of electricians can handle all of your security lighting needs, both interior and exterior. During our initial in-home visit, our technicians will examine the property and offer suggestions to help improve the security around your property. We can install a high-quality, dependable lighting solution that meets both your needs and your budget. Trust your home, and your family, to the care of TriStar Electric. We have installed thousands of home security lighting systems throughout Maryland, Pennsylvania, and Northern Virginia. If you have any questions about Home Security Lighting in Baltimore, please contact TriStar Electric, Maryland’s premier residential and commercial electrician, by calling 410-799-5791 or 301-384-8880 or fill out the contact form on our website. Our electricians can provide you with a competitive quote that covers every stage of the process – from installation to final testing. This entry was posted on Thursday, June 26th, 2014 at 6:36 pm. Both comments and pings are currently closed.